Hi! Happy (belated) Greek Independence Day! It was on the 25th, which was when I had planned on writing my next post, but failed. The past few days I haven’t been sleeping well and I’ve been completely wiped after work so I haven’t been very productive. Also, a friend showed me this app called “Quiz Up” where you can play quiz games against other people and it has not helped my productivity at all. Sunday morning, I was watching Food Network and Giada’s show “Giada at Home” came on and I watched her make this Egg and Kale Breakfast Wrap and knew immediately I needed to try it. Not only did it look delicious, but it was also part of her segment on healthy, feel-good dishes. So I did try making it, and it was awesome! It’s not my typical breakfast, but I had it for dinner and lunch the next day and I really enjoyed it both times. Start with 6 small kale leaves. I used Lacinato Kale, but I imagine you could use any type of kale (any kale experts out there?). 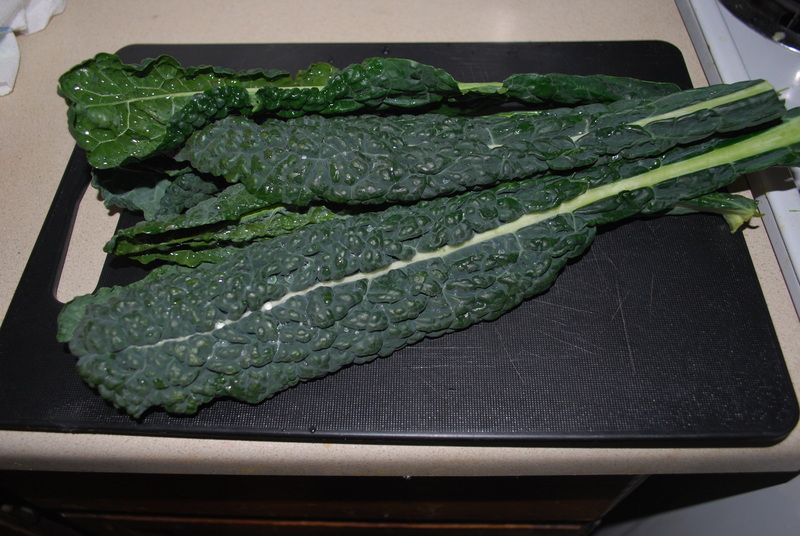 Wash the kale then cut the stems away from the leaves. 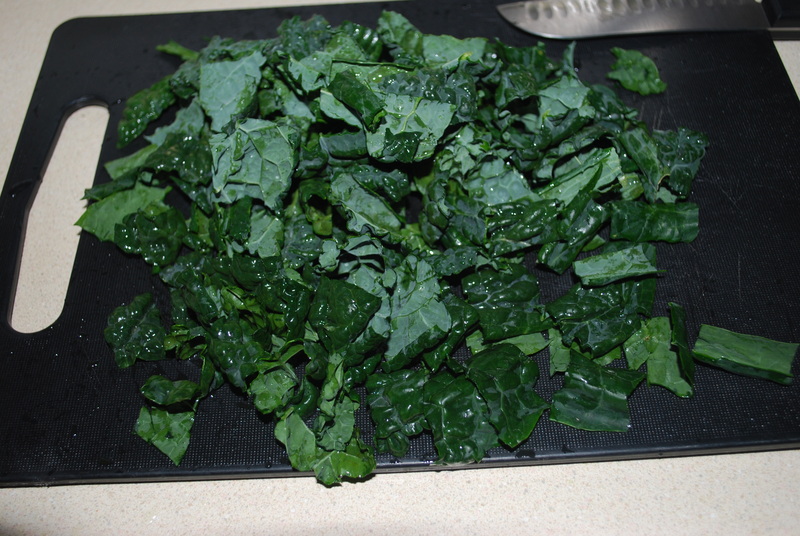 Chop the kale into 1-inch pieces. Next, you’ll need to cut 1 1/4 cup grape tomatoes into halves, chop 1 teaspoon fresh thyme, chop 2 cloves garlic, and chop 1 large shallot. Heat 2 tablespoons extra virgin olive oil in a large nonstick skillet on medium heat and add in the tomatoes, thyme, garlic, and shallots. You can also add 1/8 teaspoon red pepper flakes. It doesn’t make the dish spicy, it just gives it a tiny kick. Saute about 4 minutes, until the tomatoes and shallots soften. Add in the kale and sprinkle with 1/2 teaspoon kosher salt. Toss for about 2 minutes, or until the kale softens, but is still bright green. Stir in 1/4 cup chopped basil then remove skillet from heat. Next, you’ll need to prepare a pan for poaching your egg. Find one that is wide and shallow and fill it with about 2-3 inches of water. Bring the water to a simmer (NOT a boil!). While you’re waiting for the water to simmer, take a wrap-sized tortilla and microwave it for about 20-30 seconds. Spread it with a tablespoon of store-bought (or homemade!) hummus. Add 1/4 of the kale mixture onto the tortilla. When your water is simmering, you can poach your egg. I will admit this was my first time ever poaching an egg so I was a little nervous! I messed up 3 eggs but after that I got the hang of it and my 4th was perfect. Here is what worked for me when poaching. If you have a lemon, you can add some lemon juice to the water. It helps keep the whites together but is not necessary. Don’t salt the water! Take a wooden spoon and stir the water to create a vortex in the middle. Don’t be really aggressive, it should be more of a gentle swirl. Take your egg and break it into a small bowl. Slowly and gently pour the egg into the middle of the vortex. Stir the water around the egg gently again and make sure your egg isn’t stuck to the bottom of the pan. When the egg white looks set and the yolk is still soft, about 2-3 minutes, use a slotted spoon to remove the egg from the water. Dab the egg very gently on a paper towel to remove some of the excess water, then place it on top of the kale mixture on the tortilla. This recipe makes 4 servings so you can go ahead and make 3 more eggs (feel free to cook more than one at once, just be careful not to crowd them). Slit the yolk with a sharp knife and press down a little so that the yolk starts to drip down. Fold up the bottom of the tortilla then fold in the sides and serve with the top open. I loved this wrap! I thought spinach would also work really well and I might try that next time I make it. You can find Giada’s recipe here on foodnetwork.com. This entry was posted in Breakfast, Dinner, Healthy, Lunch and tagged egg, garlic, healthy, hummus, kale, shallots, tomatoes, wrap. Bookmark the permalink.